Palmistry, chiromancy, or palm reading, is one of the oldest methods of foretelling the past, present and future, by reading the lines of the hand. It is a form of divination practised all over the world. The earliest recorded evidence of this divination technique has been found in Asia, from where it spread to the rest of the world. Each person has unique lines and shape of hand. Thus the use of fingerprinting in identifying individuals. In palmistry, the lines and shape of the hands indicate a person’s character, marriage, how many children they will have, as well as the foreboding of positive and negative life events. The palm reader deciphers the lines and shape of the sitter’s hand to predict the future. The more a palmist studies the hand, the more they will see. Reading the lines of the hand is much like reading a map. 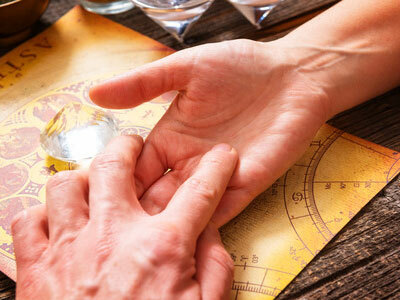 Some people are of the opinion that a reader does not require any psychic or intuitive abilities to accurately predict the future using palmistry. I disagree with that train of thought. I feel when doing any kind of divination, the reader always uses the psychic senses, especially intuition. The shapes, lines, mounds and markings of an individual hand have certain universal meanings in palmistry. The shape of the hand, fingers and thumb are all indicators of the sitters own ‘personal GPS’ so to speak. The shape of the thumb may indicate, for example, whether a person is driven by emotions or logic, creativity or analysis. Each interpretation of the palm symbolism is dependent on the language of the individual hand. For example, when you shake a hand and it is sweaty, it may indicate that the person is nervous, or they could just be hot. My own father used to say if a person gives you a limp handshake… don’t trust them. My dad used his intuition to become a very successful business man. Most palmist that have been practicing the art a long time use both hands in readings. The right hand may appear very different from the left hand. Usually the hand one writes with is known as the major hand – the hand that shows when a person will reach their full potential in life. The minor hand will show the potential a person was born with. The palm may help a person with the choices of what I call the ride of your life. The ride from birth to death. There are many different roads to reach the same destination. A square hand shape is usually associated with a down-to-earth person, honest, realistic, sensible and resourceful. They are usually good at business, and very hard workers. The spatulate hand people are may be confrontational and daring not boring at all. They are energetic and motivated. The conic hand people are sensitive, optimistic, peace loving, family is very important. The knotted hand people tend to be very intellectual, they are interesting, and good company good teachers. Also, perpetual students always learning. They prefer to live in a tranquil environment. The pointed hand people are known as the most psychic of all. They are empathies, sensitive, imaginative. It is very hard for them to hide their feelings. They are affectionate and fall in love easily. They try to avoid confrontation at all cost. They have a great need to be appreciated and a have a high degree of extra sensory perception. The mixed hand people are a mixture of two or more of the other types. They are a blend of creative, practical. They usually choose to travel the read less followed. They are very interesting people who are interested in worldly affairs. They tend to analyze all aspects of a situation. All aspects of the hand are considered by a proficient palm reader. The fingers, the finger nails, length, shape, all the lines, marriage, heart, Apollo, line of intuition, girdle of Venus, fate line, head line, life line, line of mars. Dots are usually warnings of some sort depending where they appear on the hand. In conclusion, it’s up to the individual what they choose to believe. Palmistry is an art, not a science. One thing is for sure, people that choose to have a palm reading will have an interesting time. It may even help them to make some significant life decisions. Always remember, you always have a choice. Elizabeth's talents go back several generations. She found her own gifts and embraced them at an early age, recognizing the difference between herself and most others around her. She's since honed and mastered many metaphysical practices, providing hypnotherapy, Psychic Mediumship, Mysticism, and Hypno-Reiki to her clients in Maine, and in areas around the US and in Canada, where she travels. A lover of pets, they are her greatest teachers and these unconditionally loving creatures often chime in on a reading in addition to the Angels, Guides and loved ones who provide resolution and answers for each of her clients. Elizabeth is also an author with much spiritual wisdom to impart and is currently working on a book. If you'd like to be a recipient of her unique Psychic Wisdom, find peace and receive answers that will also benefit your highest good, you can reach Elizabeth at Psychic Access.